One of the most common questions I’m being asked right now is how to help your baby who has the flu. I’m convinced it’s just as miserable for a mom to watch their sick baby as it is for the sick baby herself! The great news is that you can fight the flu, and you can easily acquire the supplies to do so. Get as much breastmilk into him as possible. It will have the antibodies you’re building against the same virus to help your baby fight the flu, too. It can also pass on helpful virus fighting properties from the herbs and spices you ingest! Diffuse virus killing and respiratory support essential oils, thirty minutes at a time. Good ones may be eucalyptus radiata, oregano, tea tree oil, wild orange, ravensara, white fir, and lemon. Avoid peppermint, rosemary, and eucalyptus globulus as they can cause respiratory depression, including respiratory arrest, in young children. Use an infant-appropriate vapor rub on the child’s feet and cover with socks. The oils in the vapor rub will be absorbed through the feet, include the reflex points that the child needs to support the organs affected by the flu. I make my own and avoid the commercial ones because I don’t want the petroleum and other junk that’s often in them. ALWAYS check your ingredients, as I’ve even seen “natural” ones including essential oils like peppermint in them. Humidify the air using a cold air humidifier. In a pinch, create steam in the bathroom with your shower. If you’re breastfeeding, start ingesting virus fighting herbs and spices such as fresh garlic, tumeric (always combine with black pepper), ginger, rosemary, oregano, basil. Also increase your vitamin and mineral uptake, making sure you are getting the optimal doses. Avoid Tylenol as it depresses the immune system. If you cannot avoid an NSAID, use Ibuprofin over acetaminophen, and remember to treat the child, not the thermometer number. Hyland’s Colic, Teething, or Cold tablets may provide pain relief and fever support and are gentler on the body! Rest, hydrate, and keep warm. Get everyone in the house washing their hands! Saline nose spray or breastmilk (yes, sprayed in the nose) and then sucked out with a Nose Freida (can’t believe we ever lived without one!) to reduce upper respiratory congestion. Elevate head/chest to help breathing. Lots of foods can be a help in fighting illness! Consider the spices and herbs above, as well as making a bone broth, Golden Milk (a very yummy tumeric tea recipe), chicken, and tummy settling things like fennel if baby is experiencing tummy upset (will also pass through breastmilk). Elderberry syrup that doesn’t contain honey. Reduce intake of mucous producing products, like milk and acidic juices. Avoid sugar, white flour, and processed foods that tax the body and increase inflammation. Elderberry syrup with local, raw honey if possible. Honey infused with fresh garlic and onion (chop your garlic and let sit in the air for 15 minutes, then combine with chopped onion, cover with honey, and simmer on stove for 20 minutes. Bottle the entire thing and keep in the refrigerator–eat a spoonful or two every day). Remember that just because something is natural, doesn’t mean it’s appropriate or safe for every person. And just because a “natural” company or a “natural” product says it’s safe for children, remember that anyone can make a product and the creator, while having good intentions and a good idea, may not be trained in safe use of oils or herbs! Listen to your mommy or daddy instinct, listen to your child, and practice common sense. 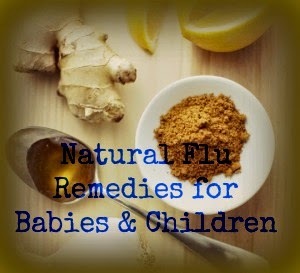 What natural flu remedies have you tried for your little ones before? Disclaimer: I am not a doctor and this is not medical advice, nor is anything here intended to treat, diagnose, cure, or otherwise do anything for you or anyone else. The information written here is just that–information. Always consult a medical professional, not a blogger, for medical advice.